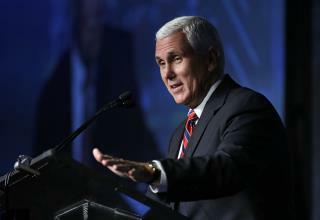 (Newser) – Vice presidential candidate Mike Pence appears to be trying to calm the controversy that erupted over the weekend in the wake of Donald Trump's back and forth with the parents of a fallen US Muslim soldier. "Donald Trump and I believe that Captain Humayun Khan is an American hero and his family, like all Gold Star families, should be cherished by every American," Pence wrote on Facebook. He said Khan died fighting in a region made unstable by the "disastrous decisions of Barack Obama and Hillary Clinton," and asserted that Trump's policies—including a suspension of "immigration from countries that have been compromised by terrorism"—will help bring down the Islamic State and make it less likely that more American soldiers will die. Forrest T and No-sense Pence. Pair of corrupt republicons, perfect for their minority rabble of supporters. Did you notice the caption beneath the picture of Pence? It says he's addressing the annual meeting of ALEC, which is the most evil political organization in America. Worse than the KKK with far more power.